Bolton Area Divers came into existence over 15 years ago as a divers "drop in centre", somewhere to go for advice, air fills and training. At the end of 2003 the current owner closed the business and the associated dive club started to break apart. 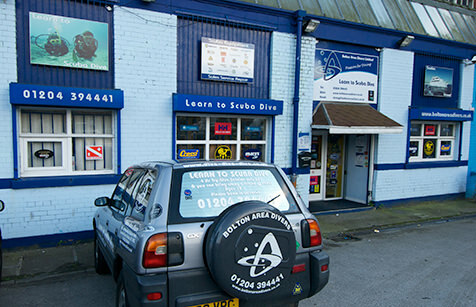 At the start of 2004 11 Club members, all with full time jobs, came together to form ‘Bolton Area Divers Limited’. Because of our love of diving the 11 members voluntarily run the non-profit business with the aim of once again providing the ‘drop in centre’ for the local dive community. The business regained PADI 5star status and became a dealer for the major brands of dive equipment that divers believe in and trust. The club has since grown to over 200 paid up members and circulates its monthly newsletter to over 1400 divers. The club dives locally and worldwide so the business is kept busy very with training and sales. A club member can hire a full set of dive equipment for just £25 for 4 days. The doors are open to all divers BSAC, SSAC, SAA, CMAS, NAUI & TDI (sorry if I left anyone out) who are welcome to use the state of the art training suites and facilities (as long as they replace the tea, coffee and milk).